from the 2017 Congressional Medal of Honor Society Convention! 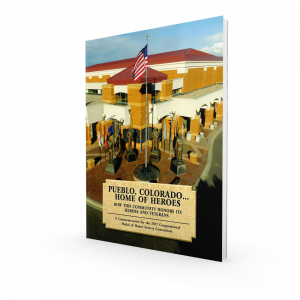 This 64-page glossy booklet was created by the Pueblo Home of Heroes Association with financial assistance from the Robert Hoag Rawlings Foundation. It was handed out to those attending the Medal of Honor Society’s Patriots Gala the last night of the Convention, and now is being sold to help the Pueblo Home of Heroes Association with the upkeep of the Pueblo Medal of Honor Memorial. 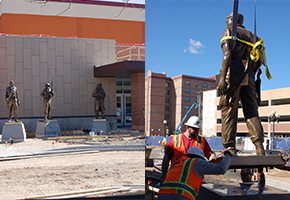 Through the years since the end of the first World War, many Pueblo organizations created wonderful memorials and plaques and placed them in locations of prominence honoring our American military. Since the 2000 Congressional Medal of Honor Society’s convention, many occasions have brought active and former military together to honor and be honored in a variety of ways. This book has been created to highlight many of these memorials and events. The names of 6,600 area veterans on Veteran’s Bridge at HARP are also listed in the last pages of the book. While not claiming to have all the memorials in the Pueblo area it is a great representation of the way Pueblo has, and is, continuing to honor its heroes and veterans. The 2000 and 2017 Congressional Medal of Honor Conventions.